on a wrist watch, the two most important displays for daily life are time and date. 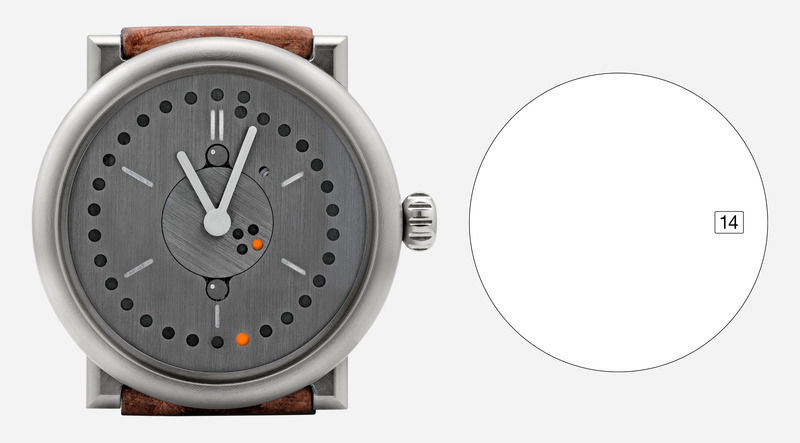 time is usually displayed via the hour, minute, and second hands on a 12-hour dial, while the date on wrist watches is generally shown as a number between 1 and 31 in a little window by the 3 o’clock marker. the readability of the two indications – the analogue display for the time and the digital one for the date – differs, however. the difference corresponds to a ratio of about 1:10.
this does in no way reflect that the two are of roughly the same importance and that, correspondingly, it should be possible to read them with approximately the same ease. 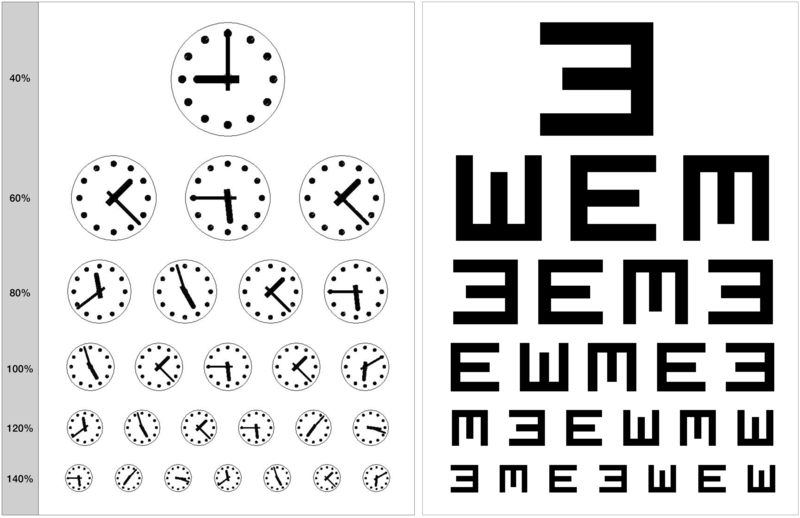 comparisons of the readability charts of the analogue display and the digital display, which are inspired by the testing charts for visual acuity used by eye specialists, show that a similar readability of the analogue and the digital display can only be achieved when the size of the digital display corresponds to about two thirds of the analogue one, or the dial. 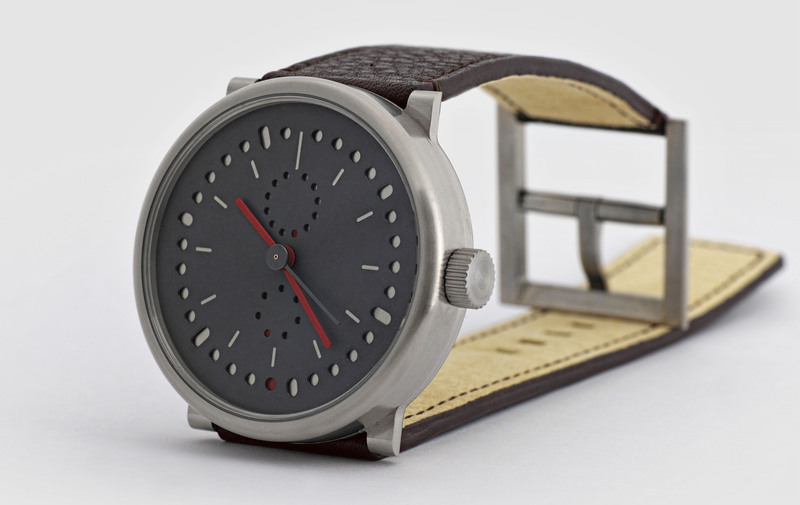 incorporating a digital display of that size in a mechanical watch requires excessive mechanical complexity. the analogue display needs to be changed into a digital one or vice versa, the digital display needs to be replaced by an analogue one. since digitalizing the display of the time would also mean reducing its size to that of the date display, the good readability of the analogue display would be traded in for the lesser level of the digital display. if one wants to insist on the good readability of the analogue display, the only solution is to try and find a way to adapt the digital display to the analogue one. while it might be possible to show the date by means of a hand on a separate dial or with a circle of numbered sections for the 31 possible days of a month, this hand might come into conflict with the other hands that show the time when the watch is read. 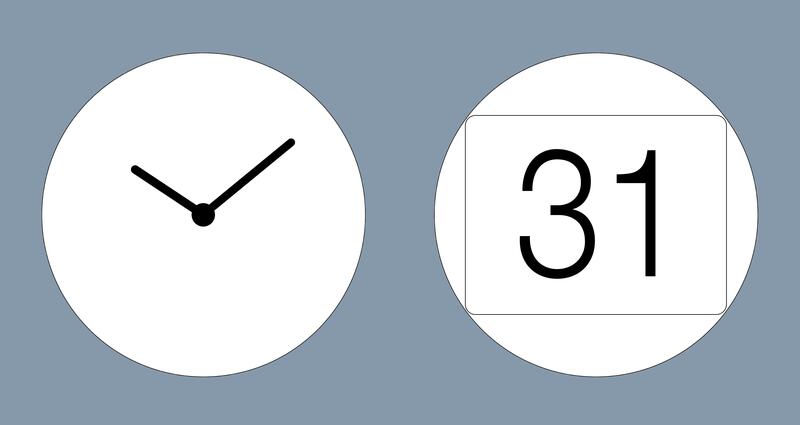 an attempt can be made, however, to replace the 31 indices of the date’s number circle with holes and the corresponding hand with a dot wandering behind these holes. an examination of the readability of this kind of display yielded the result that it does not quite match the excellent readability of the analogue time display, but that the difference in readability between the time and date displays has been reduced to a ratio of approximately 1:2.
this led to the decision to find solutions using a series of dots, respectively a wandering dot for the date display. 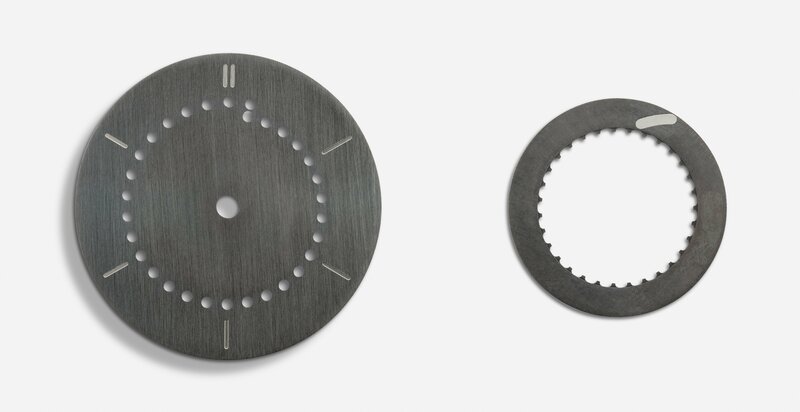 a series of 31 holes with a wandering dot calls for a scale with a clear beginning and for easy readability of the date dot among the possible 31 dates of a month. a first solution was to leave a gap in the circle of 31 holes between the 31st day of a month and the 1st of the next month, and to introduce a marker or change the size of every fifth hole. specifically, the holes for the 5th, 15th and 25th day of the month were widened on the outside, and those for the 10th, the 20th, and the 30th day on the inside as well as on the outside. the remark of a client (messmer) that 31 and 30 – the latter corresponding to half of the scale for 60 minutes, or 60 seconds – were so close to each other that an attempt should be made to work with a division of 30 and to thus bring the two mutually jarring scales of 31 and 60 into concert, spurred the efforts to search for a solution of this kind. after looking into complex mechanical approaches which would place the 31st hole on the outside or inside of a circle of 30 holes either above or below the 30th or the 1st, and which would require the dot to jump from the hole for the 30th day up or down to the 31st and then back into the circle for the 1st, a solution to this effect was rejected because of the excessive complexity such a solution would require. the considerations, however, where the display dot would have to be positioned in order to appear next in the hole of the 1st day of the month when it is now visible in the hole of the 31st which is on the in- or outside of the circle, ultimately led to the solution of a continuous series of 31 holes that spiral outwards from the hole of the 1st to the one of the 31st which is then positioned above the 1st. the dot behind the holes has to take the shape of a banana connecting the position of the 31st hole with an notional position right in front of the 1st. this banana can be applied as a display dot right on the date ring instead of the 31 numbers. since the date ring completes a full circle in 31 steps in one month, the date dot continuously wanders on and outwards, forming said banana and being one step ahead at the end; this is compensated back to the first at the change of date. thus, a purely graphic solution was found for the issue of adapting 31 date holes to a division of 30.
this graphic solution, which allows for a scale of 30 and thus extracts the analogue display from the conflict area between 60 and 31, because 30 corresponds to half of 60, opened up the possibility of using the scale of the 60-divison for that of 30 as well. highlighting the 10-markers of the 60-scale results in a simultaneous highlighting of the 5-steps in the 30-scale, or hole circle, of the date display. 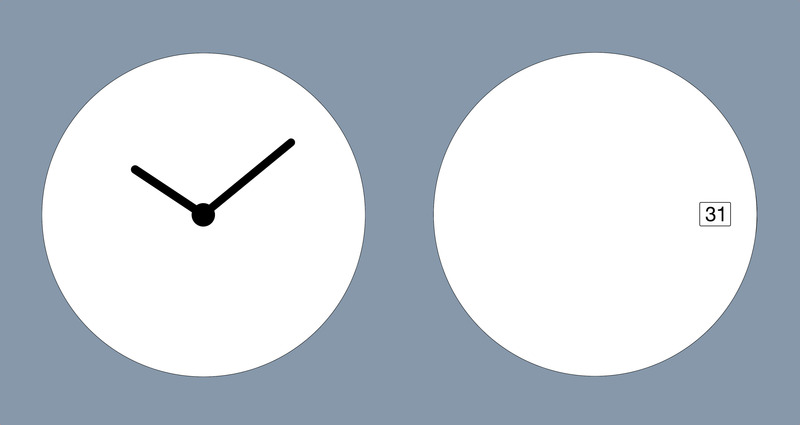 daytime and date can thus be shown on the same analogue scale and the date can be read as intuitively as the time.